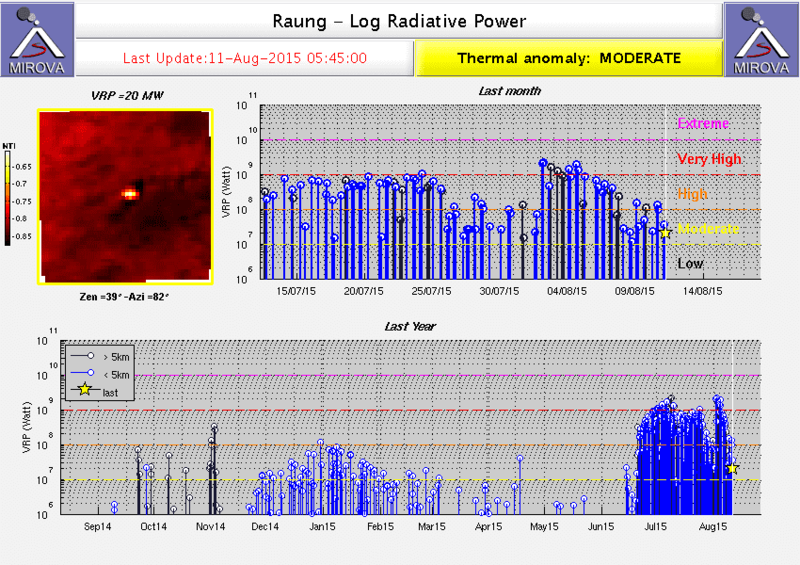 Raung (East Java): Activity has decreased at the volcano. During the past days, the ash plume was much lower and only extended several tens of kilometers in southerly directions. Sinabung (Sumatra, Indonesia): According to a news article in the Indonesian press, volcanologists monitoring Sinabung believe that magma supply to the growing lava dome has recently increased. The volcano is kepts at the highest alert status ("awas" or 4 out of 4) and an exclusion zone of 7 km is kept in place. At the same time, only smaller collapse events and a small pyroclastic flow on 7 Aug have occurred during the past week. Most of the previous lava dome and its dangerous lobes clinging onto the steep upper slopes had been destroyed by the collapses in late July and the first days of August. Dukono (Halmahera): The volcano continues to produce near-continuous ash clouds that reached a length of approx. 100 km towards the west this morning. Colima (Western Mexico): Explosions remain frequent and sometimes intense. Ash columns rise up to 2 km from the crater.